Mr. Methfessel began the practice of law with Liberty Mutual Insurance Company as a trial attorney. During his time with Liberty Mutual he tried cases throughout the state of New Jersey. Thereafter, he joined a defense firm, again as a trial attorney representing the defense of insurance company claims throughout the state. Within three years he became a partner in that law firm. 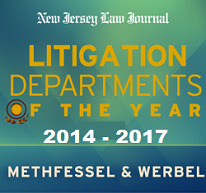 In May of 1972, he founded the law firm of Methfessel & Werbel with Joel N. Werbel. He continued to specialize in the trial of insurance defense cases including liability, policy suits, and fire subrogation cases. He spent the next 20 years as a trial attorney handling cases involving personal injury, malpractice, arson, and liquor liability. During his career he was requested to testify before several senate committees regarding anticipated legislation involving the insurance industry. Mr. Methfessel has litigated cases on behalf of Kraft Foods, Quaker Oats, Philip Morris, Caesar’s, Harrah’s and Resorts International casinos as well as a myriad of other corporate litigants. Mr. Methfessel has been a lecturer for the Skills Course required of newly admitted lawyers in New Jersey. He has been a guest speaker art the New Jersey Association of Mutual Insurance Companies, New Jersey Claimsmen’s Association, the Independent Adjusters Association of New Jersey, and the New Jersey Association of Mutual Insurance Women. He is a member of the New Jersey Defense Association, New Jersey Claimsmen’s Association, and attorney to the Adjusters Association of New Jersey. He was also attorney to the Rahway Board of Adjustment. He has participated as a judge in the Seton Hall Law School Moot Court program and has been a guest lecturer at Seton Hall Law School.